With high rainfall in the upper Murray River catchment over winter, the Hume Dam has been filling fast. Run-off into the dam went from the lowest 10% on record in May to the highest 10% in July. In all likelihood the dam will fill, so the Murray Darling Basin Authority have started releasing water at low rates to make room for incoming flows and rainfall. As many people are aware, there is already water moving through the region from rainfall and the tributaries feeding the Murray, such as the Kiewa River. If you are on the Murray River downstream of the Hume Dam you might need to adjust your activities and move stock, pumps, boat moorings and other equipment as river levels rise. It might also affect your access to parts of the floodplain. People around Albury, Wodonga, Corowa and other towns, communities and farming areas could be most affected. Significant rainfall could lead to flooding. Advice on preparing for a flood is available on the Victorian SES or NSW SES FloodSafe websites. It’s also recommended that you register to receive timely messages about changes to river flows from WaterNSW whether you’re in NSW or Victoria. It’s important in times of flood to look to the Bureau of Meteorology (BoM), the agency responsible for issuing flood warnings. The BoM issues flood watch and flood warnings when rivers are expected to rise above the river bank. Check out their current warnings for floods and other weather events in the NSW and Victorian Murray region. Call 132 500 for emergency help during a flood in NSW or Victoria. If required, an evacuation message would come from the NSW State Emergency Service (SES) or Victoria Police. We monitor in-flows and water movement through the river system every day. This helps us manage releases of water from the reservoirs in the River Murray System and direct the state dam operators how much water to send downstream and when to do it. mitigate flood impacts and provide environmental benefit. During times of plentiful water we use forecasts to estimate the rain that is coming, and the current and potential inflows. This also helps us gauge whether it is possible to release water from the dam over a number of days before it fills, to better manage any flooding. 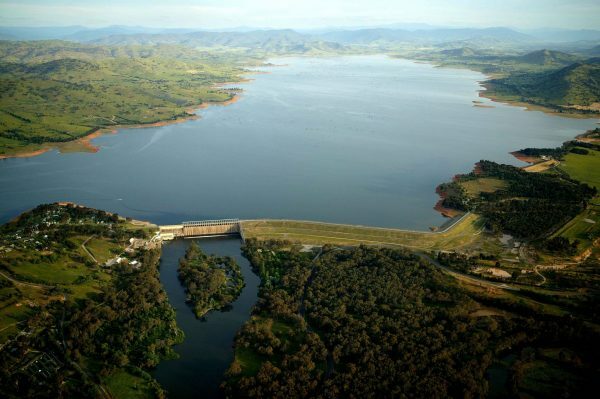 Check our website if you would like more detailed information about flood management for the Hume Dam. Lake Hume in the New South Wales Riverina region. Photo by Michael Bell.